Installing a tile shower pan can help to eliminate unseen water leaks underneath the tile floor. Even though you don’t see water leaking doesn’t mean it’s not there. 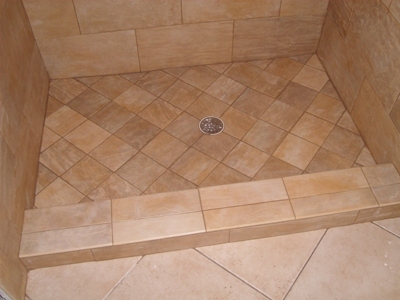 A tile shower pan can give you added piece of mind and help to preserve your tile floor. Why Do I Need a Shower Pan? If you have a ceramic tile shower floor you need to know it’s not waterproof. Most ceramic tile floors are water resistant instead. This means the grout can still allow water to seep through underneath the tiles. This can cause your tiles to become loose and possibly crumble and break apart. Worse than this, the water that seeps through the tiles can damage the substrate flooring. You can install a shower liner yourself with just a little bit of patience. The first thing you need to do is measure the shower floor accurately. Once you have your measurements you can go to your local hardware store and purchase a flexible shower liner. The best kind to find is one made of CPE or PVC. These are virtually indestructible. You’ll want to cut a hole in the subfloor directly in the center of the shower floor for the drain. It’s best to start with a smaller hole, and cut it bigger if needed. But having a drain hole that is too big can cause problems later on. Since the grout will eventually break down, you want to make sure you install a drain trap to catch any debris that may come off. Not doing this can cause a lot of problems later with clogged pipes. A drain catch is relatively inexpensive and easy to place. During installation it’s a good idea to place a piece of duct tape over the drain to catch any debris that may fall while you are working. If you’ve purchased a pre-measured liner, you just need to nail it in to the studs on the wall. If you haven’t purchased a pre-measured liner, you will need to do some cutting. The liner needs to come up around the wall at least 9 inches. Attach the liner directly to the framing studs. Spread the liner from the drain outward toward the framing. This will help it lay flat against the floor. Once it’s flat, you can fold the corners and nail or staple the liner directly to the framing. Work around the perimeter of the liner, attaching it to the frame as you work. Once you’ve worked all the way around, you can test to ensure it will work properly by filling the shower up to the curb and letting the water sit for a few hours. Check for leaks and repair as necessary. As long as you don’t see any leaks you can remove the duct tape from the drain and work on the floor. Now that you have installed your floor pan liner you can go ahead and install the tile as you normally would.